The Outback Classic Hutch is a comfy, 2-level wooden hutch made of hardened spruce. See below for the best deal on Outback Classic Hutch with Run. Big Savings on Outback Classic Hutch with Run! The Outback Classic Hutch is a comfy, 2-level wooden hutch made of hardened spruce. The upper part of the hutch consists of an enclosed sleeping area and an open living space. Both can be easily reached via the two doors on the front and through the roof. The front of the sleeping area is fitted with a small wooden door to protect your pet against intensive sun rays, wind and rain, and provide it with a place to retreat to. The large door on the left of the hutchs upper level is fitted with wire mesh to ensure your pet always has plenty of fresh air flowing through its home. This also allows you to keep an eye on your pet. A lockable small passageway with a ramp connects the upper hutch to the run below. With this you can decide whether to keep your pet upstairs in the hutch or to allow it use both levels. If you want to use the hutch all day long, it is important that your pet is protected against predators, and its times like those that being able to lock the upper level is particularly useful. The Outback Classic Hutch with Run at a glance: Rabbit hutch with integrated run, dual levels Upper hutch area: hutch and separate sleeping area Lower hutch area: run Two levels are connected via a ramp and a small passageway Lockable passageway door for all-day use Small pet hutch: safe night-time retreat, protection against predators 2 front doors: wooden door (sleeping area) and mesh door (hutch area) Wooden door: protection against wind and rain, total relaxation Mesh door: plenty of fresh air, good air ventilation in hutch, orientation for your pet Easy access to pet and hutch via front doors Tar papered roof totally opens up Weather-proof Special floor cover for easy cleaning Made of hardened spruce Easy assembly Please Note: Classic II & Run cannot be delivered to Northern Ireland. Technical Details at a glance: Dimensions Compact I. Compact II. Total size (LxWxH) 104 x 52 x 92 cm 116 x 63 x 92 cm Bar thickness x 2 / 3 cm (vertically / horizontally) x 2 / 3 cm (vertically / horizontally) Bar spacing 2.5 cm 2.5 cm Interior (LxWxH) 89.5 x 42.5 x 44.5/37 (front/back) cm 101.5 x 53.5 x44.5/37 (front/back) cm Total height 92/89 cm (front/back) 92/89 cm (front/back) Roof incl. hinges (LxH) 104 x 52 cm 116 x 63 cm Wooden door (LxH) 27 x 37 cm cm 27 x 37 cm Wall thickness 1 cm 1 cm For additional information regarding advised care, safety and liability, please read the attached "Hutch and Runs Information"
The Outback Classic Hutch is a comfy, 2-level wooden hutch made of hardened spruce. The upper part o.. Please note: the cover only fits previous models! The protective cover is simply extended around you.. 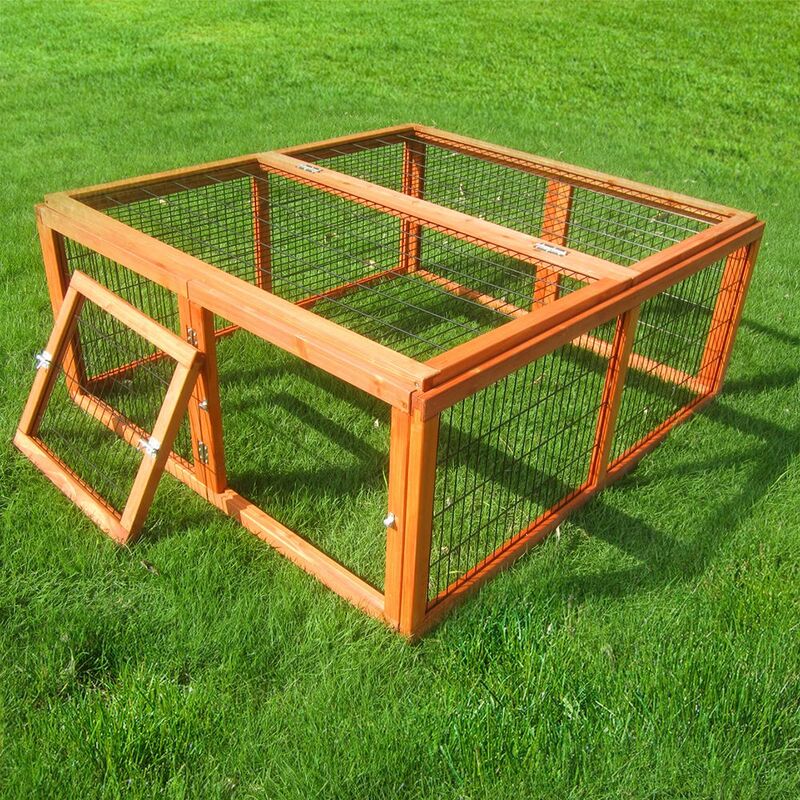 The Outback Classic Hutch hutch is a classic home for small pets living outdoors. It is divided into.. The Best Deals online for Outback Classic Hutch with Run and your essential Pet Supply Products. Order over £29 and get FREE DELIVERY on all orders today. Most orders are processed and dispatched within 24 hours from this supplier (zooplus) and their delivery service partners provide online parcel tracking facilities, active from 2-3 days after dispatch of your Outback Classic Hutch with Run order. The suplier 'zooplus' offers International shipping to the countries listed in the table below for shipping on Outback Classic Hutch with Run.